Heat oven to 425°F. Line 15x10x1-inch pan with foil. Spray foil with cooking spray. In large microwavable bowl, place 3 tablespoons of the butter. Microwave uncovered on High 30 to 60 seconds or until melted. Stir in garlic powder and pepper. Add potatoes and onion wedges; toss to coat. Place mixture in pan. Sprinkle with 2 rounded tablespoons of the ranch dressing mix. Toss to coat, then spread in single layer in pan. Turn potatoes skin-side down. Roast 29 to 33 minutes or until potatoes are very tender when pierced with knife. Remove from oven; stir. In same bowl, place 1 more tablespoon butter; microwave uncovered on High 15 to 30 seconds or until melted. Stir in salt. Add broccoli to mixture; toss to coat. Arrange in single layer in pan next to potato mixture. Roast 11 to 14 minutes longer or until potatoes are browned and broccoli is tender. Meanwhile, melt remaining 1 tablespoon butter in 8-inch skillet over medium heat. Add bread crumbs; cook 2 to 3 minutes, stirring frequently, until golden brown. Remove from heat; stir in remaining 1 rounded tablespoon ranch dressing mix. Pour into small bowl; stir in Parmesan cheese. Top vegetables with bread crumb mixture and parsley. 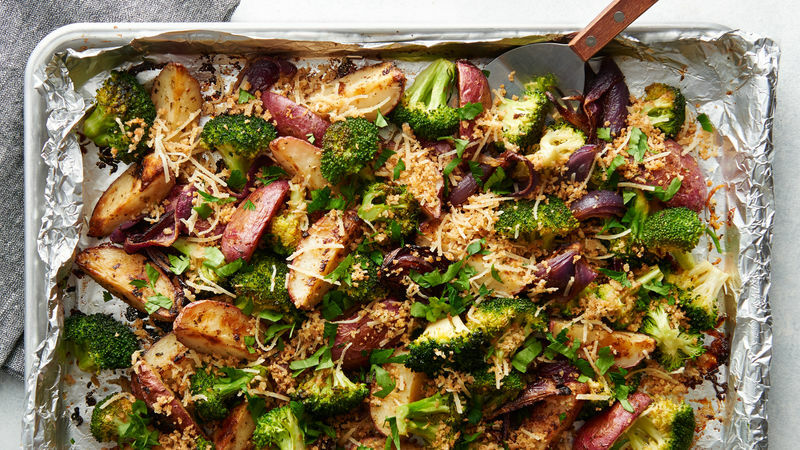 There’s no need to clean the bowl used to toss the potatoes and onions—just set it aside until it’s time to toss the broccoli. Flip potatoes onto cut side when you stir them so they make contact with the hot pan and brown nicely. Dry ranch dressing mix has thickeners in it, so you can’t add it to the butter mixture and toss the potatoes in it in the bowl. It has to be sprinkled over and tossed in the pan. Save some time by purchasing bagged broccoli florets. Cut any large pieces for even cooking. Once the broccoli is as tender as you like, these veggies are ready! If you like your broccoli a little firmer, feel free to pull out the veggies a couple of minutes early. Potato sizes are regulated by the U.S. Department of Agriculture, and baby red B-size potatoes are 1.5 to 2.25 inches in diameter. They’re great in this recipe because their small size ensures they get done roasting at the same time as the other vegetables. However, if some potatoes are larger, don’t fret. Simply cut in 6 pieces so all of the pieces are similar in size. This recipe is a great way to use up the veggies we often have on hand. We love serving it up alongside pork chops or chicken breasts for an easy and delicious family dinner.